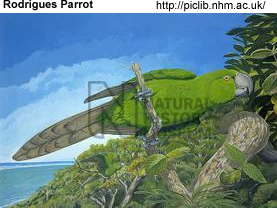 The Rodrigues Parrot (Necropsittacus rodericanus) is an extinct species of parrot which once lived on the Mascarene island of Rodrigues. It is known from subfossil bones and the 1708 description of Leguat as well as the 1726 report of Julien Tafforet. The birds were described as generally of green coloration, with a large head and beak and a long tail, and being in size markedly larger than a pigeon, or considerably so than the local parakeet. The fossils, which include a partial skull, prove that the bird had a bill adapted to cracking the hardest seeds, convergent with South American Ara macaws. Tafforet speaks of their habits in some detail: At his time (when the island was long overrun with rats), the birds stayed mostly on the Islet au Mt (Gobrani Island) south of mainland Rodriguez. They were observed feeding on the small, black and hard seeds or fruit of a tree with leaves having a strong citrus smell. Fresh water was obtained on the mainland. From Réunion, Dubois in 1674 described a parrot that was green, with the head, tail and the upper wings fiery red. This bird was described by Rothschild as Necropsittacus borbonicus, and apparently again, this time erroneously assuming there were similar reports from Mauritius, as N. francicus. However, Dubois makes it clear that the parrots he talks about were smaller than pigeons, and thus it is unlikely that these birds were closely allied with the Rodrigues Parrot. It has been hypothesized that the reports refer to an escaped pet or feral birds, but no explanation brought forth this far seems very convincing. All that can be said is that the only parrot unequivocally known from Réunion this far is the Mascarene Parrot, with the tentative evidence for the erstwhile existence of the Réunion Parakeet seeming plausible. Probably having been driven from the mainland by the rats in the late 17th century, the birds became increasingly rate as predators multiplied and spread to the offshore islets. In 1761, Pingré found the birds rare, with but a few still found. It was the last report on this species.